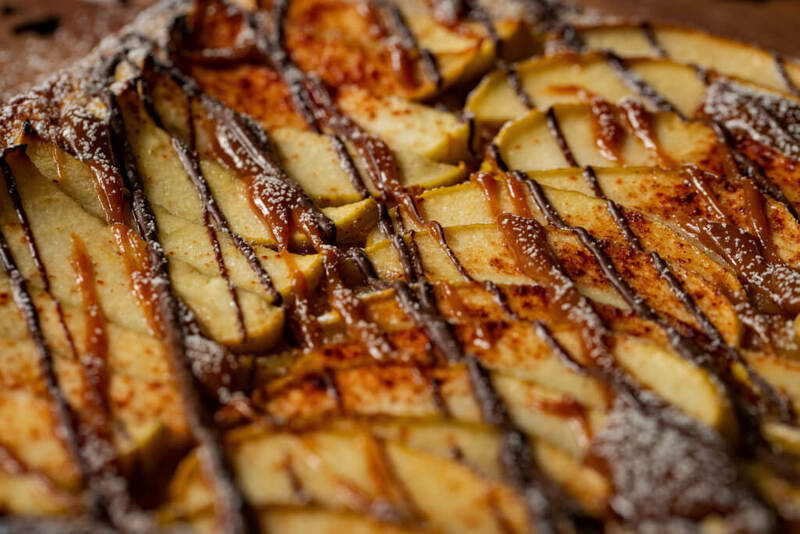 Slices of Golden Delicious apples, crispy pastry, warm caramel drizzle, and, if you are feeling particularly jazzy, some vanilla ice cream, is what makes up our Golden Delicious Apple Flatbread. Warning: These square slices may become your family’s dessert of choice. Custom-top each slice with a topping bar or surprise your family with different toppings with each bake! 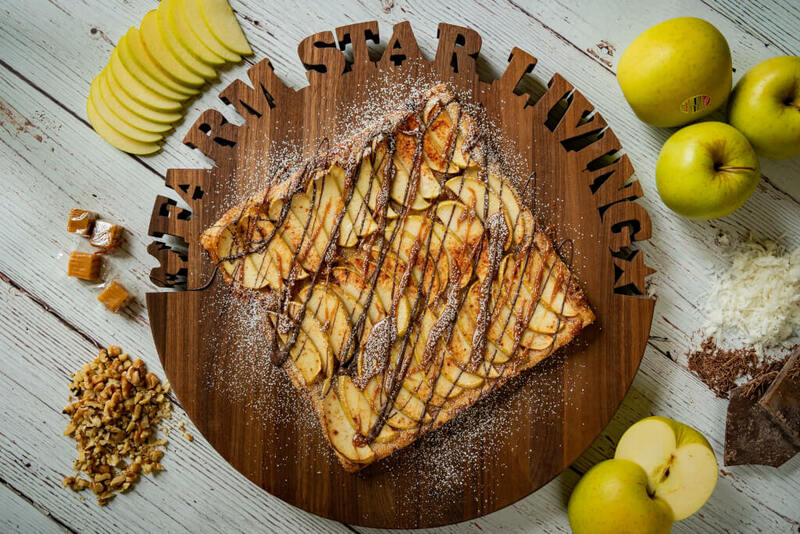 Either way, there is no mistaking the star of this bake—the Golden Delicious from Rice Fruit Company. Best described as “sweet natured,” this company is located at the heart of Pennsylvania’s apple country, rural Adams Country. There, the soil and climate are ideal for growing a crunchy, full-flavored apple. The company currently packs and stores twelve other varieties of apples and three varieties of stone fruit. 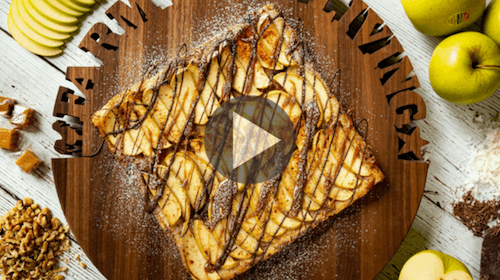 Discover the sweet natured flavor of the Golden Delicious in this exceptional yet simple bake! Heat oven to 425F and allow puff pastry to thaw - about 30 minutes. Slice Golden Delicious Apples into thin wedges. Avoid creating paper thin slices as apples will be too thin to withstand the oven and may dry out. Place Apple slices into a bowl and squeeze with fresh lemon to keep from browning. Toss to coat. Line a baking sheet with parchment paper and unfold puff pastry onto parchment. Brush melted butter over the entire surface of the puff pastry. Sprinkle 1 tbsp of sugar and 1/s tbsp of cinnamon over puff pastry. 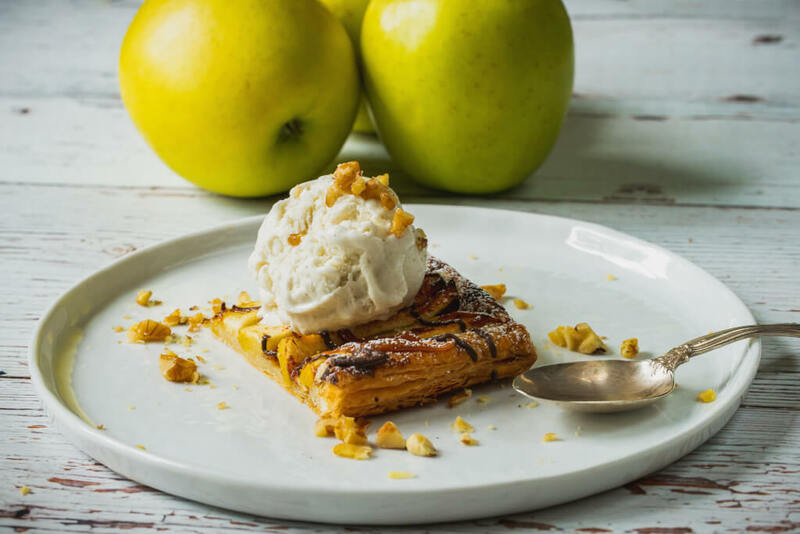 Arrange apples onto puff pastry slightly overlapping each apple slice. To fill the puff pastry, you should have 3-4 rows of Apple slices. 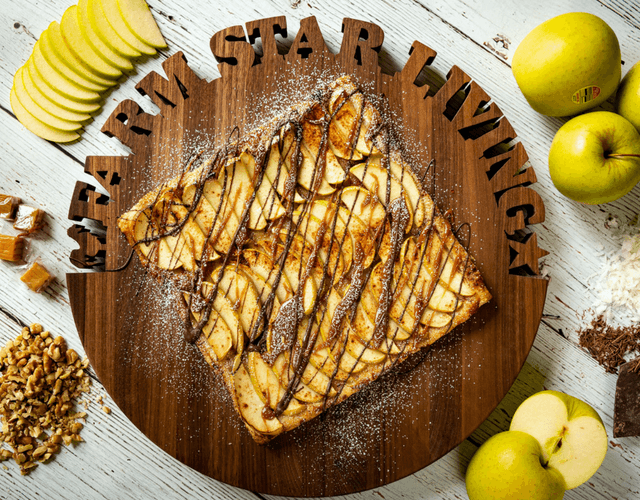 Heat 1 tbsp honey in the microwave for 10 seconds and carefully brush over apple slices. Lightly sprinkle with remaining cinnamon. Bake for 20-25 minutes or until puff pastry is golden brown. While the pastry is cooling, warm caramel and drizzle over the top of the pastry with a spoon. Get creative and top with nuts, chocolate chips or melted chocolate, shredded coconut, or even some vanilla ice cream! Add a dusting of powdered sugar and slice into squares. Enjoy!